Wireless audio is a big hit, and is quickly becoming the latest serial home invader. You won’t see it, but these days you will certainly hear it, loud and clear. If less than a decade ago a wireless speaker could barely rival a cranked-up pair of headphones, you can now expect bags of volume, lots of smart features and great performance. The Cambridge Audio Minx Air 200 is one such system, an upgraded version of an earlier model. Although it features a lot of new tech, this is not a novelty act - Cambridge Audio have been around since 1968, and have had plenty of great products. 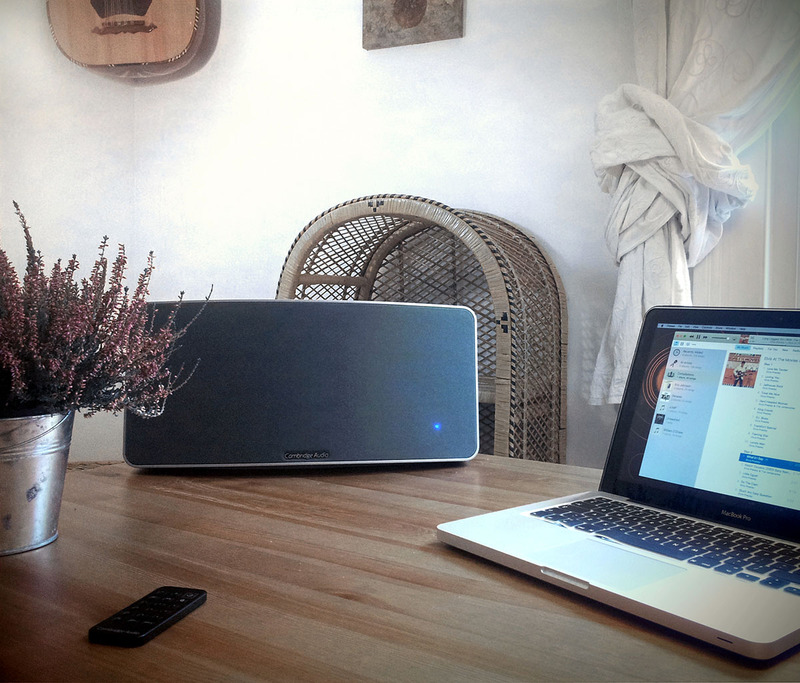 The ever-growing crowd of wireless music lovers will no doubt enjoy this system, with its improved sound and the uncanny ability to ‘see’ every smartphone, tablet and laptop around. With Apple AirPlay, Bluetooth, and instant access to Spotify and Internet radio, Cambridge Audio have made wireless music streaming as easy as eating a meal. Whether you’re wielding a smartphone or a tablet (Android, Apple iOS or Windows) they’ll all know that the Air 200 is in the room, and will happily talk wireless to it. If you have a home network connection (and we’re guessing you probably do), then your laptop or desktop computer can join the party too and stream through your WiFi; there’s even an Ethernet port for a wired network connection. Naturally, with their old-school roots, Cambridge Audio have not forgotten to include analog inputs. At the back you have a pair of RCA (Phono) Ins as well as a minijack (3.5mm) input, so you can also connect two wired audio devices. To take advantage of the WiFi mode, the Air 200 needs first to be synced to your router, and that can unfortunately be done only via a computer. It would have been so much better if this process could be completed through the app instead. In its present setup version though, your PC has to first connect to the speaker’s own WiFi network, via a supplied IP address typed in a browser. The required password (which is that of your home network router) also needs to be popped into the setup screen. Once you’ve jumped through those hoops, the Air’s connection is confirmed by a solid green light on the back of the unit. On the plus side, the Minx smartphone app is very self-explanatory, offering easy source selection, internet radio browsing, EQ and volume controls, and last but not least - free lifetime technical support. The main app screen displays a list of ten popular radio presets, but you can replace them by browsing locations and genres, of which there are more than 20,000 to choose from. These presets correspond to the physical buttons on the top left corner of the unit, meaning that any selections going into the app’s slots become your easily accessible favorite stations - straight from the speaker. Next up - Bluetooth mode. Pairing works as in with most Bluetooth speakers: press the pairing button on the unit (or remote), select the Air 200 from your device and after a few seconds and a reassuring beep, the front LED light changes its color to blue, and the Air 200 is connected to your device. Not sure if the 200 is using Airplay or Bluetooth? All the guesswork has been taken out - the front LED’s color changes depending on the wireless mode currently in use (even the two analog inputs have designated LED colors). For simple functions you can use the included credit card-sized remote control. This can switch sources, offers easy access to your ten favorite radio channels, sports the usual Mute, On/Off buttons, as well as adjustments for volume and bass level. All of these functions can be accessed from the Air app, and we have to say that the remote feels a bit like a bonus with its somewhat flimsy design. It’s fair to say that this speaker deserved a far better remote control. The ‘200’ name is derived from the unit’s power output - here we have 200 watts (peak power) driving a pair of Cambridge Audio’s 2.25-inch drivers and a 6.5-inch subwoofer. The company’s patented balanced mode radiator (BMR) drivers are designed to move air in a specific way as to disperse sound more widely and is reassuring to know that the same units are also used in Cambridge Audio’s $1500 flagship products. For a long time, Bluetooth audio has had a reputation for sounding grainy, and is often intermittent due to its being a compressed format. We’re happy to report that the Cambridge Air features the latest generation AptX mode, which can vastly improve audio detail and depth with its ability to stream higher resolution audio - even up to CD quality. Using WiFi, the results are nearly identical - if the AirPlay mode exhibits a bit of a woolier sound character, the Bluetooth delivers a tighter, crisper and somewhat more transparent performance. The Minx’s case has an elegant curve to it and feels durable. It’s also acoustically damped within, which helps elimination of vibration and distortion, and the smart people designing it have even used the handle in the upper back to serve as a bass port. With the company’s claim that this is one of the loudest wireless speakers currently on the market, we were ready for volume. It’s fair to say that this isn’t the smallest speaker (17.7” x 6.9"), but for its size the sound is immense. It’s surprisingly wide and dispersed, and we were faced with a muscular and round-sounding bass delivery, warm mids and quite a lot of crisp detail at the top frequency spectrum. The included bass control (found as a control at the back of the unit as well as on the remote) can really help in dialling in the right balance. The acoustic port slash handle clearly helps the low-end, although bass delivery felt a bit wooly and overpowering on a few occasions - which, we should say, is quite normal for ported bass speaker designs. Turning the bass down slightly and notching the main volume up a step seemed to improve things, and ultimately the speaker system performed exceedingly well with a number of genres - from vintage Americana and deep electronica, and all the way to Swedish metal. Movie soundtracks sounded good, too. The Air app’s EQ presets can prove very helpful if you have an odd-sounding room, especially as your usual placement suspects - large wooden desks, tables or shelves can often mangle the sound. If you are planning to crank up the volume, keep this speaker away from walls and corners, or turn the bass down sligthly. Using the Cambridge Audio Air 200 for the best part of three weeks has been liberating. After the initial setup is done, you just end up forgetting about it, which is always a hallmark of the best music systems. It’s a great system which, despite having a couple of flaws, is a very solid contender in a crowded marketplace. We’re impressed. Setup can be tricky, app could be a little better. And the remote is flimsy. Anyone looking for a great mid-priced wireless speaker platform. With its unique design and big stereo sound, the Airstream S200 is a worthy alternative to Cambridge Audio's speaker. Go for this one if you have a slightly bigger room. And go for this one if you have a monstrously-large room. At a time when audio equipment is geared towards the future, when wireless speakers, phone docks and surround sound are ubiquitous, you might think that the humble tabletop radio is extinct. Not even close.